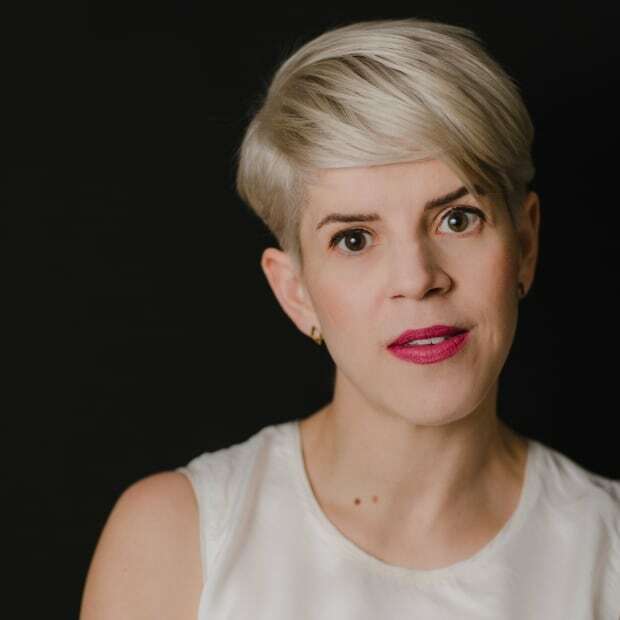 After managing the fight against last summer's massive Shovel Lake fire, a member of the B.C. Wildfire Service filed a complaint about all the dead wood he was seeing on the ground. But as it turns out, every logging company in the area had met their legal requirements under B.C. 's Wildfire Act. After managing the fight against last summer's massive Shovel Lake fire, a member of the B.C. Wildfire Service had a major complaint about what he was seeing on the ground. He'd noticed large piles of logs and other woody debris lined up along roads in the wildfire zone near the northern community of Fraser Lake, west of Prince George, B.C. He suspected all that timber was helping the fire spread and intensify, and filed a complaint with B.C. 's forestry watchdog, the Forest Practices Board. 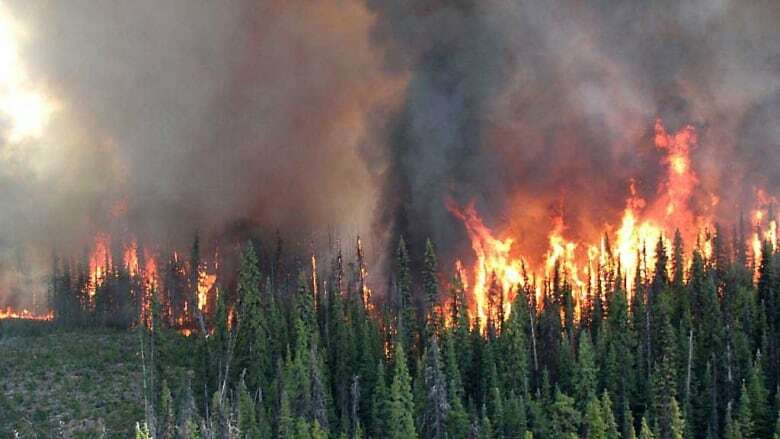 "The complainant told the board that he has worked throughout the province and has never seen the amount of debris that he saw at the Shovel Lake wildfire," an investigative report from the board says. 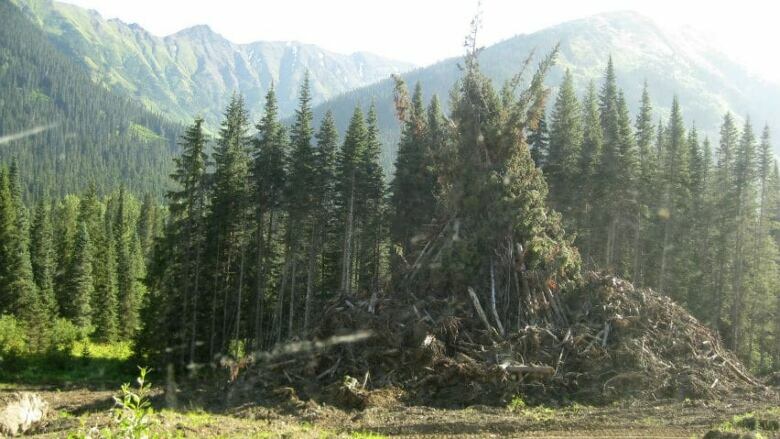 But as it turns out, every logging company in the area had met their legal requirements under B.C. 's Wildfire Act for clearing out wood and debris. "If [the time frame] could be reduced, you'd basically improve your chances of fighting fires in those areas," the board's chair, Kevin Kriese, told CBC. "If they can reduce it even a little, that would be helpful." Right now, forestry companies have 30 months — a full two and a half years — to clean up debris after logging. Even then, huge amounts of dead, woody material are allowed to remain on the ground. 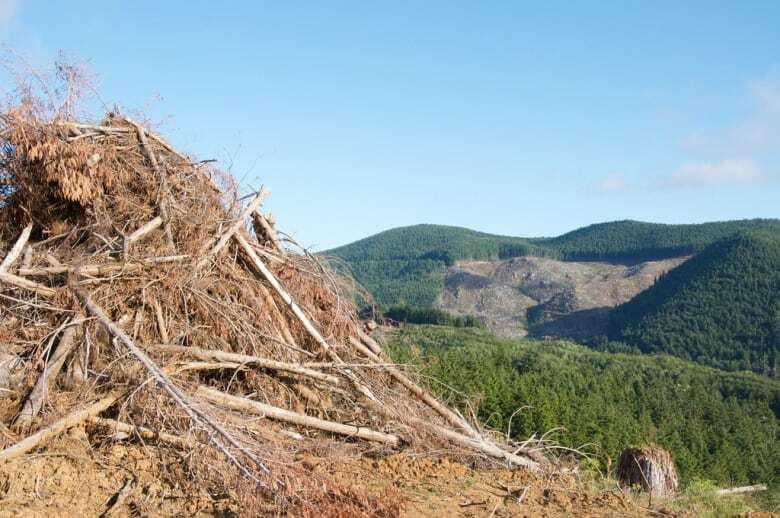 On a relatively flat, south-facing surface, up to 99 tonnes of branches and twigs can be left behind in every hectare of lodgepole pine that's been harvested, according to the board's report. After two record-breaking wildfire seasons in a row, the province is listening to the board's concerns. "The ministry agrees the current time period of 30 months is too long and has already started reviewing the guidelines with a view to making changes," a forests ministry spokesperson said in an email. The wildfire service has formed a working group to look at the current strategy for dealing with fire hazards on the landscape, according to the board. The Shovel Lake fire was sparked last July and eventually burned through 922 square kilometres, forcing evacuations, destroying buildings and threatening the Fort St. James National Historic Site. It was one of the biggest wildfires in B.C. 's worst season on record. Forests in the area had been hit hard by the mountain pine beetle — trees killed during an infestation can fuel particularly intense wildfires. Combine that with the effects of climate change and the results are potentially catastrophic, according to the board. The annual allowable cut for the area around the Shovel Lake fire was increased in 2002 in an attempt to deal with beetle-killed trees and potentially head off the threat of fire. The impact of that plan was complicated in 2004 when the Wildfire Act came into force and extended the deadline for dealing with logging debris by almost a year from the previous limit of 19 months. The reasoning for the extra time was to give the pellet industry a chance to come in and collect the woody leftovers, according to the board's report. Taken together, increases to the allowable cut and the timeframe for cleaning up debris meant that huge swaths of the region's landscape were covered with woody slash. "According to B.C. Wildfire Service staff, when a fire gets going in this situation and is accompanied by drought conditions, 'only a change in the weather can put it out,' " the report says. The board also points out that the forestry industry used to rely on prescribed burning to deal with fire hazards, but that has virtually been abandoned in recent decades because of public complaints about the smoke. That has only contributed to the problem. Kriese said B.C. 's forest industry often gets a lot of flak from the public, but when it comes to wildfire prevention, these companies play a crucial role. "In terms of fuel reduction, the logging they're doing out there is actually really positive. We want to encourage them to still go back into these pine beetle stands," Kriese said. Diamond Isinger, a spokesperson for the Council of Forest Industries, said industry representatives have yet to review the watchdog's report, but they look forward to looking at the recommendations. The board has asked for a response from the government outlining its progress by the end of the year.